Nicholas uses a very natural colour pallet for his oil portraits. He works closely with the client to make sure the colours and tones of their horse are perfect. He matches the exact day and time of year from the photo he is using as reference for the painting. It is so important that the correct colours are used to capture your horses coat perfectly. Coupled with this, the backgrounds must also compliment the horse well and in the oil painting of Ebony below, you can see the background has been kept light and fresh, similar to the reference photo. Scroll down further to see more photos of Ebony and read about the commission. We would also love it if you shared our page using the buttons below! Samantha Campbell form the UK,, emails us in 2011 to find out if we would be able to paint a portrait of her dearly missed horse called Ebony. Sam said in one of her early emails - 'Unfortunately Ebony had to be put to sleep. She was 29 so she had a good innings but she was in fine form and was still being ridden so it has been a bit of a shock and we are very sad to lose her (she had colic).' 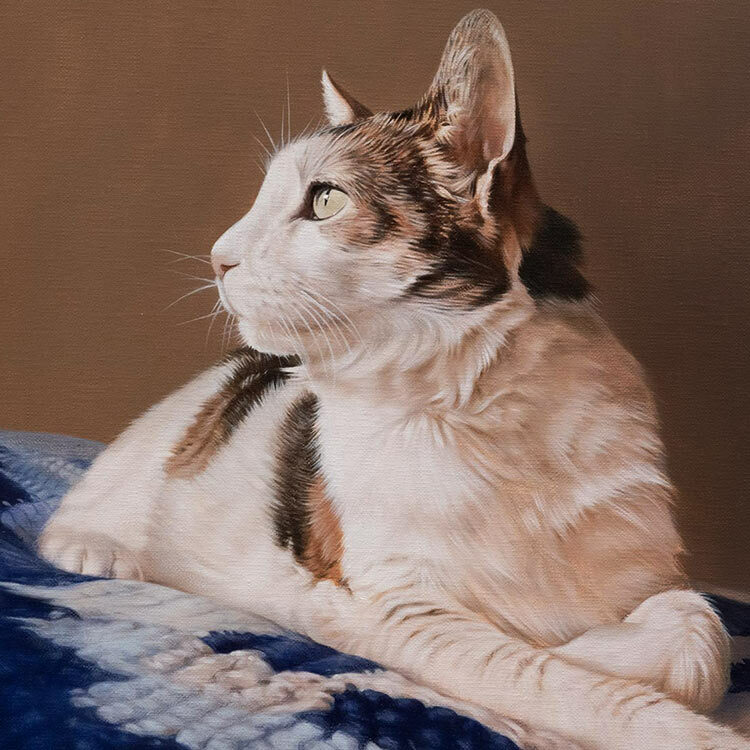 We are always so sorry to hear when our beloved animals have passed away and we were thrilled to be able to create an oil painting for Sam and her family to help remember her by. As you can see form the portrait above Nicholas painted Ebony with tack, exactly as shown in the photo, which you can see on the left. He created a similar background without the distraction of the buildings behind Ebony. The photo Nicholas used was absolutely perfect, it was very clear and in focus and this is key for a good portrait. Sam was thrilled with the final outcome and will be having the painting framed in an antique frame which she will find locally to her. We are looking forward to seeing it! We received a lovely email from Sam when she saw the final stage of the oil painting. We love hearing about our customer service too! I think the portrait is lovely - captures her perfectly. Thanks for your fabulous customer service! 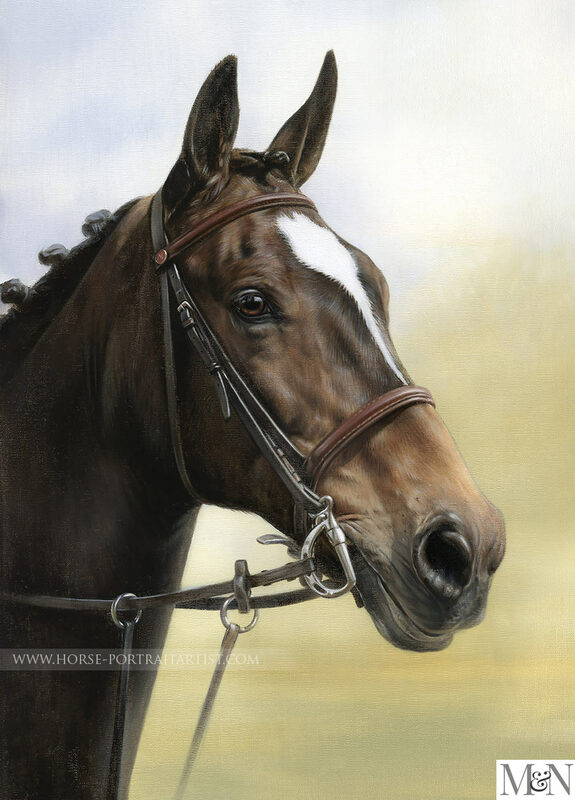 If you have enjoyed viewing Ebony's oil painting and you would like to commission a portrait of your horse, whether a head study like this or a full body oil painting, we would be thrilled to work with you. 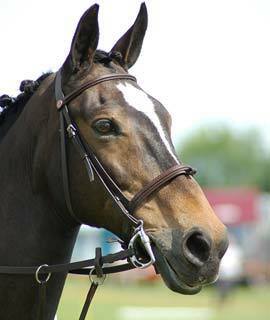 Why not email us your photos via our Horse Portraits Contact page.